Collecting and sharing the folktales & ghost stories of Southern California. These are our stories. Let us tell them once more & re-enchant our world. Interlopers from Japan? Mass UFO sighting? What caused the military to fire into the skies over LA on February 25, 1942? Today's guest is the Southern California director of MUFON, Jeff Krause. Theme Music courtesy of DL-sounds.com. In the early morning hours of February 25th, 1942, air raid sirens sounded throughout Los Angeles County. A total blackout had been ordered and thousands of neighborhood air raid wardens were summoned to their positions. At 3:16 am, the 37th Coast Artillery Brigade began firing machine guns and anti-aircraft shells into the air, targeting a reported aircraft; by dawn, over 1,400 shells would be fired. And then it was quiet. The events of that night would be explained, then denied; defended and then debated. Ultimately, the military would dismiss it all as overwrought nerves. But there were plenty of Angelenos who swore that what they saw in the sky that night was not a figment of World War II era imaginations. Something was there… an unidentified flying object in the truest sense. Was it a military plane? A commercial plane? The ever-convenient weather balloon? In true folklore tradition, the stories about what people saw that night have each come to take on a life of their own. 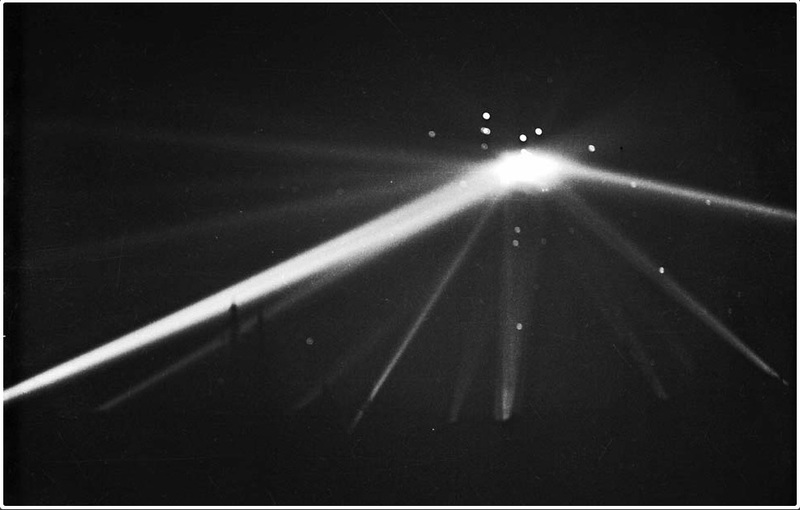 What they actually saw may never be known, but whatever it was provoked THE BATTLE OF LOS ANGELES. What many people may not know is that the night BEFORE The Battle of Los Angeles, there was The Bombardment of Ellwood – just a short distance north of Los Angeles, in a town along the Santa Barbara coastline, near Goleta. It was the evening of February 23, 1942 and President Franklin D. Roosevelt was giving one of his legendary fireside chats to the nation. He was just five minutes into his address when a Japanese submarine, which had crept in along the Santa Barbara coastline, launched thirteen shells into a tidewater refinery installation. For the next twenty minutes, the submarine continued to deliver shots from its 5½-inch guns. The bombardment of ammunition did some minor damage to piers and oil wells, but it completely missed the gasoline plant - which in all likelihood was what it was actually aiming for. In response, the military dispatched planes to the area in an effort to locate and pursue the submarine. Soon, three bombers joined the pursuit and attempted to destroy the vessel, but without success. The US Army Air Forces opted not to send any more planes or units out to take care of the interloping submarine – and this is thought to be because they believed such a random, non-damaging attack may be launched by the enemy to keep our resources busy so that a larger attack could be carried out on a more significant target. There were even some in the Japanese-American community who had predicted a demonstration of presence from Japan would be made in connection with the President's radio address. They also predicted that Los Angeles would be attacked the very next night. The Navy, too, was convinced that some new, grander attack must be imminent, and on February 24th - the morning after The Bombardment of Ellwood - a warning was issued by Naval Intelligence indicating that an attack could be expected within the next ten hours. Newspapers announced that a strict state of readiness had been imposed. There was a good reason for everyone to be on their toes: even though the damage from the skirmish at Ellwood had been minimal, the event marked the first shelling of the U.S. mainland. And so on February 24th, there was nothing to do but wait and watch. The prior day’s incident at Ellwood notwithstanding, anxiety over potential Japanese attacks on the mainland was already at an all-time high. It had only been two months since Japan bombed Pearl Harbor and brought the country into World War II - so anti-aircraft defenses on the west coast were on continuous alert. Rumors abounded in the Japanese-American communities of coming attacks, and from those rumors came tips to the War Department - which in turn resulted in orders for a series of high alerts in coastal defenses from Seattle to San Diego. Because the fear that gripped the nation was so particularly intense along the west coast, Roosevelt would soon order all residents of Japanese descent (most of them U.S. citizens) to evacuate the area. This resulted in the forced relocation of more than 100,000 people to one of 10 internment camps located across the United States – 2 of which were in California. And so day after day and night after night, anti-aircraft personnel -- numbering over 8,000 in the Los Angeles area alone – had been waiting in anxious anticipation, running daily scenarios in an effort to be more than ready should the feared Japanese strike materialize. And now, with the Bombardment of Ellwood, the threat had truly come home. To say that the scene was tense would be an understatement. There were those who were suspicious about the rumors of attack. The thinking went that a disinformation campaign might have been coordinated by the Japanese to keep American troops focused on the mainland while the Japanese attacked Alaska or the Panama Canal… In fact, all of these areas would receive Bombardment of Ellwood-style artillery shelling from Japanese vessels before 1942 was over. But February the 24th passed uneventfully, if anxiously, until 7:18 p.m. At that time, Naval Intelligence received information that another attack could be expected in the next ten hours and a renewed alert to be at the ready was sounded. Soon the 37th Brigade headquarters received “a very large number of reports of flares and blinking lights near the defense plants and oil fields". The reports were cause for alarm because the lights could be used as signals to offshore Japanese forces, allowing them to target -- or even land -- with surprising accuracy. But, again, no accompanying attack came. The night passed into early morning without further incident. The alert was lifted at 10:23 p.m. (about 3 hours after it was called), and the tension temporarily relaxed. But just a few hours later – at 1:44 a.m. in the early morning hours of the 25th, the alarm was renewed once more when a radar station picked up an unidentified flying object over the Pacific Ocean. It was heading in to the mainland – and this movement was observed and confirmed by 2 separate radar installations. By 2 a.m. the Information Center's Operation Board showed an unidentified "target 120 miles west of Los Angeles . . . well tracked by radar". At 2:15 a.m., all anti-aircraft operations were put on green alert (green for “go”, meaning they should be ready to fire). Radar tracked the approaching target as it neared the coast, and at 2:21 a.m. a blackout was ordered across the region. At 2:26 a.m., the target was tracked to within 3 miles of Los Angeles. Air raid sirens began going off as anti-aircraft guns and searchlights combed the skies over L.A., hunting for the enemy plane. At 2:43 a.m., sightings were reported near Long Beach, and a few minutes later a coast artillery colonel spotted "about 25 planes at 12,000 feet" over Los Angeles. At 3:06 a.m., panic ensued on the ground when a number of witnesses reportedly sighted a large, round object in the sky over Culver City and Santa Monica. Residents in a forty-mile arc along the coast watched from hills and rooftops and reported everything they thought they saw. In some accounts, this object was described as a large balloon with a red flare. A lieutenant reported that he had spotted 20-30 planes from the roof of a hotel in downtown Los Angeles, flying at an estimated height of 20,000 feet and at 150 miles per hour. Three guards who were with him also saw the fleet of aircraft with their searchlights, and they said they could hear even the motors, but were unable to get a visual of any of them with their field glasses. A lieutenant in southeast Los Angeles reported seeing three planes in V formation at approximately 9,000 feet. A sergeant said he saw five planes with his naked eye flying at 30,000 feet. He said they appeared to be bombers, flying first in a wedge formation before changing to a T-formation. Another lieutenant said his men counted 14 planes 'flying high and slow'. A lieutenant at the Douglas plant said he first saw a single plane through his scope and also through his binoculars - his elevation finder showing the solo aircraft at 20,175 feet. He said this was followed a few minutes later by 3 more aircraft flying in V formation at the same elevation. At 4:15 a.m., a captain in Harbor Defenses claimed to see two groupings of 6 planes each, while a colonel from Harbor Defenses said he saw a single group of three. A private from the 122nd reported that he spotted five planes in a V formation, and that he also witnessed a battery firing at them. Well… he was right about something being fired at. While no one could agree on what the target WAS, there still must have been some assurance that their guns were lock on SOMETHING because the ammunition was soon flying fast and furious. And not all at once – it happened in scattered bursts. Meaning, the military locked on targets they deemed worthy of being fired upon several different times. These decisions to fire couldn’t have been made lightly – they were firing over the heads of their own citizens. And of course there would be fall-out – not just politically, but actual, physical debris hurtling from the sky. Shortly after the guns started firing, the fall-out came: shrapnel could be heard crashing down all over the city. Then there were the shots that fell short, exploding halfway to their target, sending large and small chunks of metal back toward the earth at deadly speeds. These weren’t enemy rounds or even destroyed bits of enemy wreckage - but our own U.S. anti-aircraft shells. Spectators, who had been standing in yards and on rooftops to see for themselves the cause of the alarm, went running for shelter. Ambulances and fire trucks howled their way through the blackout to traffic accidents all over town – which in turn began rumors that enemy planes had been shot down. One was even supposed to have landed in flames at a Hollywood intersection! None of the rumors of downed planes turned out to be true. Whatever the target was, it was bombarded with more than 1,400 shells from anti-aircraft guns for about an hour and a half, seemingly without being damaged or effected in any way. The final few eye witness accounts claim it moved back toward Long Beach – near where the original sightings were reported from – before vanishing completely from view. Many of those final sightings again described the target as pale orange in color and glowing. At 7:21 am, it was all over. The searchlights went out. The "all clear" was sounded. The blackout order was lifted. It is reasonable to assume that a lot of the confusion surrounding what kind and how many objects were being seen came from ammunition bursts being lit up by the searchlights – and then being mistaken for enemy planes themselves. Whatever it was that people were seeing that night, the fact remains that it, or they, dropped no bombs and suffered no losses. The mysterious glowing round object was never recovered. There was, however, a loss of lives: Three civilians were killed in car accidents and two died of heart attacks – all attributed to the stress and chaos of the evening’s events. The next morning, the incident was front-page news all along the west coast - and eventually throughout the nation - but no one could give a satisfactory explanation of what exactly had happened. of the drama. The paper also published the only known photograph of the incident. It shows nine searchlight beams coming together on an object in the Culver City sky. Fantastic blobs of light seem to dance around the searchlights at the apex of the beams – the Times article reports these were made by the glow of bursting anti-aircraft shells. Speculation ran rampant as people tried to describe (and ultimately argue about) what they had seen the night before. All were consumed with confusion. How could they all see something and so few of them agree about what it was? Why was it seemingly invulnerable to the hundreds of shells that were fired upon it? The earliest news reports echoed all of the questions, but supplied none of the answers. The military wasn’t providing any answers either; they only scoffed at reports from civilian observers who said as many as 200 planes had been spotted in the air. Army officials continued to decline to comment, but speculation soon arose that an enemy blimp might have been the target all along. This was based on the fact that the object took nearly 30 minutes to travel approximately 25 miles – much too slow to be an airplane. But police departments in Long Beach, Huntington Park, and Inglewood (all of which were war production centers at the time) had reported seeing planes overhead. In fact, the police had been SO SURE about what they saw, that during the height of the firefight - while the entire city of Los Angeles was blacked out - they arrested a number of Japanese-Americans on the Venice Pier for “signaling with flashlights”. This article went on to say that the planes flew in formations of 8 to 20 each. At 7:20 the Blackout was lifted. Other newspapers published a number of reports about speculations of a cover-up. An editorial in the Long Beach Independent wrote, "There is a mysterious reticence about the whole affair and it appears that some form of censorship is trying to halt discussion on the matter." Speculation was also rampant about the potential base locations of the invading airplanes. One theory included a secret base in northern Mexico. Another had Japanese submarines stationed just offshore with the capability of carrying planes (that particular rumor was actually pretty close to the truth). 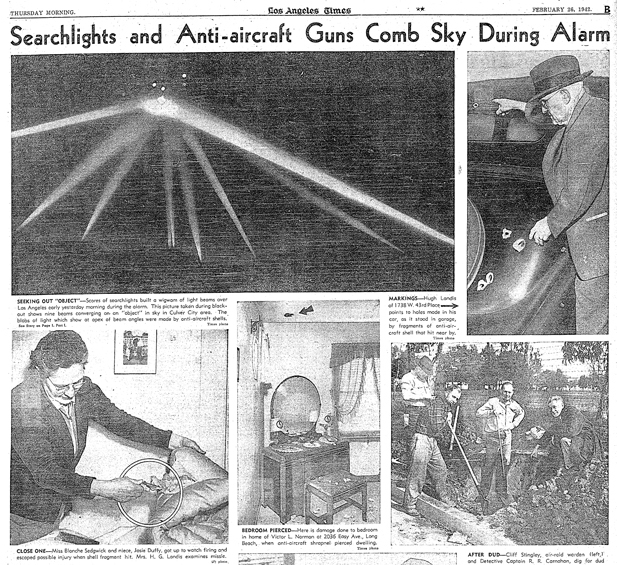 Despite the fact that the rumors and conflicting reports had by this time gripped the entire nation, the Army's Western Defense Command continued to vaguely insist that Los Angeles' early morning blackout and anti-aircraft action were the result of an unidentified aircraft sighted over the beach area. Nothing more and nothing less. And yet Army General John DeWitt, in charge of the defenses in the area, made the following transcribed telephone report to Washington on March 7, 1942: "We know that there were no Army planes . . . No Navy planes, no Coast Guard, and civilian planes -- CAA planes . . . We are still checking through Nevada and Arizona. The Governors of the states, as well as our own troops. But I am certain nothing will be found..."
Now, General DeWitt eventually came to the conclusion that, "One to five but most probably three planes appeared over Beverly Hills at an elevation of about 18,000 feet, flying very slowly. They were picked up by the searchlights and followed through to Long Beach and then to sea." Notice that he failed to mention how the “one to five, but probably 3” planes were fired upon for an extended period of time while they were being followed with no discernible damage. But at least the Army eventually stuck with one story. The Navy however, issued two separate official statements on the same day; both were issued by Secretary of the Navy Knox. In one statement, they attributed the activity to a false alarm and "jittery nerves" – but in the another statement, they reconfirmed the presence of unidentified planes over the Southland. In a further break from the Army’s narrative, a report to Washington made by the Western Defense Command shortly after the raid ended indicated that they had lost faith in the credibility of reports of an attack before the blackout was even lifted. The report stated it was their finding that “previous reports had been greatly exaggerated." U.S. War Secretary Henry L. Stimson then advanced two of his own personal theories on the mysterious craft – although it may come as a bit of a surprise that what he had to say fell in line with the public’s speculation: either they were commercial planes operated by an enemy from secret fields in California or Mexico, or they were light planes launched from Japanese submarines. The vast differences in the statements from the Army, the Navy, and the War Department did nothing to quiet the ongoing public debates. On February 26, the Los Angeles Times announced that "the considerable public excitement and confusion" caused by the alert, as well as its "spectacular official accompaniments," demanded a careful explanation. Accomplished attorney and one-time presidential candidate Wendell Willkie, speaking in Los Angeles on the same day, attempted to dissuade Californians from any belief that they had actually been under any kind of attack at all. He said that (based on his own experiences in England), when a real air raid begins "you won’t have to argue about it—you’ll just know." An editorial in the Washington Post on February 27th called the Los Angeles event a "recipe for jitters" and suggested that the Army’s theory that commercial planes might have caused the alert "explains everything except where the planes came from, where they were going, and why no American planes were sent in pursuit of them." A New York Times article from February 28th went on to say that the more the incident was studied, the more incredible it became: "If the batteries were firing on nothing at all, as Secretary Knox implies, it is a sign of expensive incompetence and jitters. If the batteries were firing on real planes, some of them as low as 9,000 feet, as Secretary Stimson declares, why were they completely ineffective? Why did no American planes go up to engage them, or even to identify them? ... What would have happened if this had been a real air raid?" When reviewing the incident a few years later in 1949, The United States Coast Artillery Association identified a meteorological balloon which was sent up at 1:00 AM that, in their words, “started all the shooting." It was their conclusion that "once the firing started, imagination created all kinds of targets in the sky and everyone joined in". Thirty-four years later in 1983, the U.S. Office of Air Force History repeated and summarized all of the past explanations as their official line: the event was a case of "war nerves" triggered by a lost weather balloon and exacerbated by stray flares and shell bursts from adjoining batteries. After the firing began, being able to see anything with certainty likely WAS difficult because of the smoke from shell bursts. But the reports of weather balloons being launched that night (whether one of them or dozens) make very little sense given that military up and down the coast was on high alert – all watching the skies and the water - for any kind of sign or signal that could be interpreted as enemy presence. And certainly it couldn’t have been a balloon they originally tracked on radar as it came in from the ocean - that target was first sighted at 120 miles away. After all was said and done, at the end of the war the Japanese stated that they did not send planes over Los Angeles or Long Beach at the time of this epic event. BUT in June of 1942 - the same year of The Bombardment of Ellwood and The Battle of Los Angeles - Japanese submarines did fire upon Fort Stevens on the Columbia River in Oregon, and Japanese submarines did fire upon Estevan Point - a Canadian lighthouse on Vancouver Island, not to mention that submarine-launched aircraft were also used by Japan over Brookings, Oregon that same year. So, even though there is no conclusive proof that the Japanese (or anyone else) attacked Los Angeles on Feb. 25, 1942, the fact that The Bombardment of Ellwood (which the Japanese do admit to) had happened only a day before and just two hours up the road. Along with these other minor attacks along the coast within a relatively short period of time, it all seems too convenient to be mere coincidence. For the last several years, ufologists have speculated that the actual aerial targets of all of those rounds of fire on that chaotic February evening were most likely extraterrestrial spaceships—a theory that provided inspiration for the film Battle: Los Angeles. The truth about what happened will likely never be known. In the end, the only thing we can say for sure is that whatever the “target” of all the anti-aircraft fire really was – even after all this time, it is inarguably an official unidentified flying object. The Army Air Forces in World War II, prepared under the editorship of Wesley Frank Craven, James Lea Cate. v.1, pp. 277–286, Washington, D.C. : Office of Air Force History. "Enemy Planes Sighted Over L.A.! February 25, 1942". The Los Angeles Times. The Daily Mirror. February 20, 2009. Hoosevelt, Theodore. "Forgotten History: Japanese Submarine Opens Fire on Santa Barbara." HistoryThings.com December 2015. Harnisch, Larry. "Japan Attacks LA?" The Los Angeles Times. The Daily Mirror. February 26, 2008. Harnisch, Larry. "Another Good Story Ruined - The Battle of Los Angeles". The Los Angeles Times. The Daily Mirror. February 21, 2011. "The Battle of Los Angeles." Saturday Night Uforia. Web. Kaye, Don. "6 Things You Didn't Know About the REAL Battle of Los Angeles." Blastr.com. December 14, 2012.